Villa Volcan is a lovely modern five bedroom and 4 bathroom villa for up to 10 people. It is situated in the resort of Puerto Calero in Lanzarote. Only a few minutes walk to the marina, with it's designer shops, restaurants and bars, the villa is in an excellent location. There are also boat excursions and fishing which can be booked here as well as a Spa Day at one of the five star hotels. 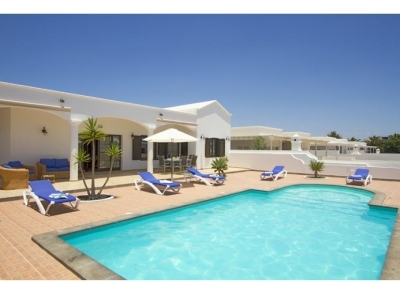 The outside area of the villa features a larger than usual pool, 10m x 4m, surrounded by ample sun loungers. The pool has solar heating. There is also a covered terrace area with comfortable sofas and a patio table and chairs plus a portable barbeque for alfresco dining. The villa is laid out over 2 levels. On the lower level there is a spacious games room with a full size pool table as well as a television and Play Station 2, with a selection of books and games. There are 3 double bedrooms and 2 twin rooms. Two of the bathrooms are ensuite. In addition there is a family bathroom and a separate toilet. The lounge as a large TV with 'TeleClub' including English channels. There is also a DVD player and wifi internet access. The kitchen is fully equipped including a dishwasher and washing machine.